Make your house feel like home again with Lumber Liquidators and their amazing partners. Enter the Home Again Sweepstakes now through November 14, 2017 and you could win and transform your space today with over $10,000 worth of prizes. The Home Again Sweepstakes is open only to legal U.S. residents residing in the 48 contiguous United States and the District of Columbia and within 50 miles driving distance from an Ashley HomeStore location, who are at least 18 years of age or the age of majority in their respective jurisdictions of permanent residence (19 years of age in Alabama and Nebraska, 21 years of age in Mississippi), whichever is older, as of the date of entry. Sweepstakes begins at 6:00:01 AM ET on August 23, 2017 and ends at 11:59:59 PM ET on November 14, 2017. Limited to a maximum of one Sweepstakes Entry per person during the entire Promotion Period. One Prize winner will be chosen via random selection from all eligible entries received. The potential winner will be contacted via email at the email address provided in the entry form. 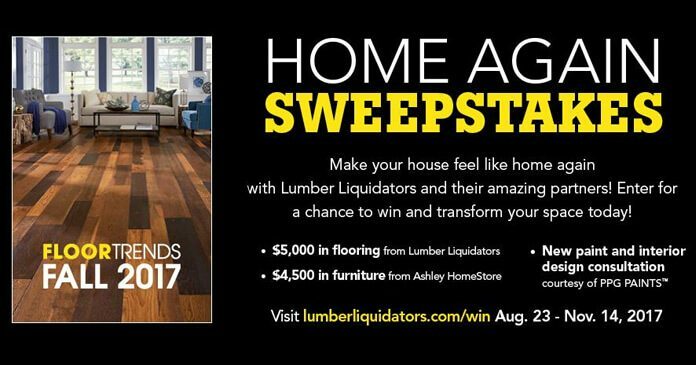 One winner will receive a gift card/store credit to Lumber Liquidators, a store credit for $1,000 worth of paint and design services from PPG, and an Ashley HomeStore shopping spree worth $4,500, in the form of a store credit or promotional code, to use at the Ashley HomeStore nearest the winner’s residence. Approximate Retail Value of Prize is $10,500. Lumber Liquidators, Inc. located at 3000 John Deere Road, Toano, VA 23168.